The beginning of smart mobility in Myanmar? Smart mobility might have been a concept lost in Myanmar previously, but starting from this year, the country has been making massive changes to its public transport system. Yangon is the commercial and probably the most developed city in the country. Ever since the liberalisation on import of foreign cars, the city’s roads and streets have been packed. What used to take an hour and a half on a day to make a certain journey now takes six hours. To amend this situation, the city’s public transportation system needs to be revamped. There are supposedly two types of public transportation in Yangon: the circular train and bus. The circular train is a 3-hour journey, going around the city, where passengers hop on and off the train as it makes stops at major towns. It has become a tourist attraction, so let’s not count this as viable public transportation service. The buses in Yangon are another story. They are cheap, making them reliant by the majority of the population, overburdened and unsafe. Each bus is supposedly allocated to own routes; however, as their pay is based on commission, the bus drivers race each other for more passengers. The government is removing this system by encouraging fixed salary with incentives approach and revoking licenses who fail to do so, to make roads safer. Additionally, the bus fare collection system is undeveloped. We have what the Burmese call a “spare” on the bus, a conductor who helps collect fares from passengers. The conductor and driver will work out a percentage amongst themselves and divide the commission. To make the bus system more efficient, at the start of this year, Yangon Region Chief Minister announced the implementation of Yangon Payment System (YPS), which will bring in YPS cards to be used on all means of public transport. The card system, of course, a technology made possible by IoT and big data, will inform Yangon Region Transport Authority to ensure better services for the public, remove the need of conductors. Understanding the travel pattern and the popular bus stations would help the bus operators know where to provide more services and frequently. Most of the passengers do not have YPS cards yet, and with the removal of conductors, the bus operators need to place fareboxes at the entry. As the system has just been introduced, it is not fully adopted yet, and unfortunately has begun to raise concerns and questions on the people’s morals. Some, assuming there will be conductors, conveniently forgets to pay. Some enter from the exit doors and never manage to pay. The rest just takes advantage of the new system by simply avoiding to pay. Apparently, the passengers take care of the bus operators in these situations. When people enter from exit doors or did not tap the card or forget to put cash in farebox, others would remind them to do so or stare until they pay. One of the private bus operator, named YPBC, has started using the farebox system since 2016, and it explained that there had not been any adverse impacts in profits. 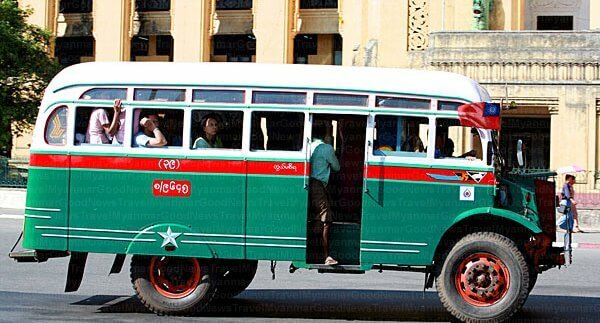 Yangon Region Transport Authority is also planning to replace the buses. There are still imported buses from the era of Japanese colonization running, which are a danger to the passengers and the public as well as to the environment. Buses made in 1995 or earlier are to be surrendered to the authority, meaning 1000 or more vehicles will be out of service, and currently the private operators are not permitted to replace on their own. To address the public transport gap in Myanmar, Singapore-based bus manufacturer, SC Auto announced two days ago, its $30 million facility set up in Yangon with the support from IE Singapore. With the aim to produce 100 buses in the first year of its foothold in the country, SC Auto will be able to satisfy the requirements more quickly in the near future. It seems that the public transport system in Myanmar is being torn down and built from scratch. There is a gap not only in the replacement of buses but also the technology from card payment to sensors to control centres, which needs to be addressed fast. With the growing traffic congestion and increasing vehicle population, the country needs to rely on technology and strict regulations to make the travelling experience safer and more efficient. The existing private operators have also embraced the card paying system. Some have already started to understand the value of IoT connectivity. However, to quickly respond to the 3 mil population in Yangon alone, the local operators would need plenty of outside help. If you are interested to understand more about the transport technology, come down to our 18th edition of Asia IoT Business Platform, happening on 23-24 November, at Sedona Hotel in Yangon. Download our brochure here for more information!